Bouncing Buttons crafts making it simple: Over a dozen time for a break. Over a dozen time for a break. I know taking a break now is not a good idea for me. I sew faster and better if I keep making things over and over. I cut out 5 diapers, added elastic, and serged all around them in record time this time (5 in a row goes fast). BUT I am getting tired of doing the same thing over and over. I can't make wipes today because I don't see any fabric in my box that I think will work well. I was running to the store yesterday to get some but my car broke so now I am stuck at home with no car. 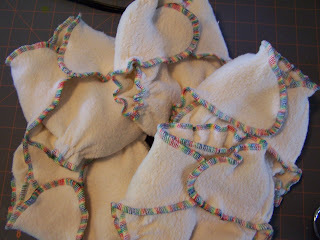 I know sherpa would work nice for wipes but I am cheap and I don't want to use any of my diaper fabric up for wipes yet. If I had 4 dozen diapers made I would think about it but 15 diapers with lots more to make yet is keeping me from using any of my diaper fabric. I think I might make something just for fun tonight. Either a bag for myself, toys for the children, or maybe I will see what fiber I have in my fiber box and spin some wool. I would like to try and knit or crochet something for the baby. I will let you all know what I came up with. Maybe I will fall asleep and not make anything. I guess I should start to think about some diaper covers. Hmmm..... I can make them with pull, procare, wool, recycled clothing. So many fun choices! I haven't made a diaper cover in umm.... Close to a year. I guess as long as I stay excited over making fun things I will keep making them. 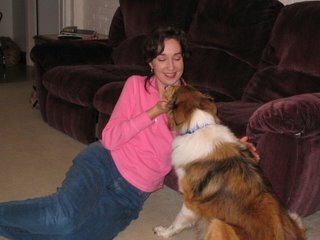 Maybe I will be ready for the baby before the birth. 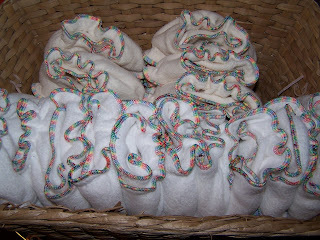 Picture of my 5 natural sherpa diapers. 15 happy diapers. Just waiting on snaps. End of my white sherpa fitted diapers!